Whenever I share my age, I mostly get the comment that I look younger and I am super flattered – I was wondering though, what is keeping me looking young? Although I know that most of my dear lasses are young looking, some may still want to know what secrets I have up my sleeve to keep looking younger than my age. So, here’s debunking to the myths – I do not follow a strict healthy diet, I do not exercise regularly, I don’t get to visit a Derma Clinic monthly and I am not taking vitamins (so bad of me). I eat in small meals every 2 hours, it doesn’t matter what I eat, as long as I do eat, but not big servings, then when I start to feel full then I stop. At work, I have biscuits at my station or crackers to fill me up if I have a hunger pang before a main meal. I am terrible at buffets and I cannot seriously relate. LOL. I have combination skin with a t-zone that is super oily with very dry areas near the hairline and sides of the face. I am pretty bad with maintaining a solid skin care ritual, but I will not skip toner and moisturizer before I put on my make up for work. I opt for a non-drying toner, those that do not have alcohol as an ingredient. It does take longer to dry but it is better than drying up your skin. This combination with a non-greasy moisturizer is my secret to success, and I sometimes use a facial mask in between. You can also try Collagen which I heard can keep your skin elastic, you can read more about Collagen supplements by clicking here. Why is this on the list again? Because, getting in touch with your inner child will keep you young. Play time with my little lad is one of my happier moments – hearing him laugh voluntarily and look at me with smiling eyes makes my heart happy. Trendy is cute but if it does not suit your age, it will actually make you look older. I like to keep my neutrals intact with the subtle hint of color from time to time. I steer away from loud prints and wearing styles which are hard to match. White, beige and a few pastels are good. Don’t go for a Fuchsia pink romper looking like you are an over sized baby. Did you know that hugs have health benefits? I have started to ask my husband for extra hugs and this is why you should always sleep next to your significant other to get more hugs. Whenever you hug someone, this helps produce Oxytocin which is released by our pituitary gland which lowers down heart rates and the hormone that causes stress, high blood pressure and heart disease otherwise known as Cortisol. There you go lasses! 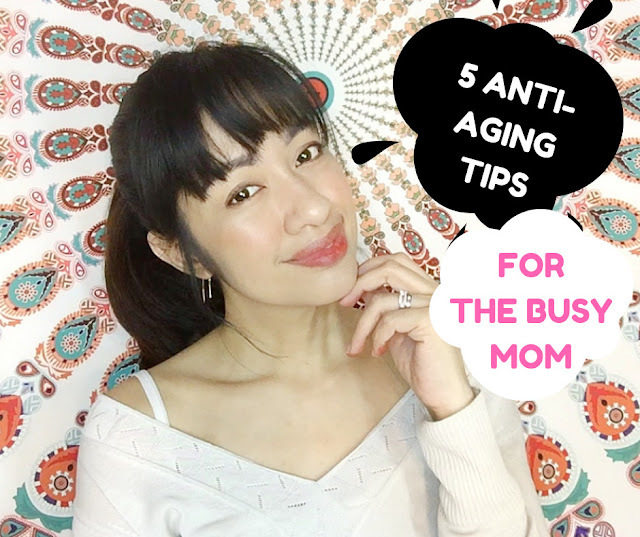 5 Anti-aging tips are not always associated to cosmetics but can always come in different forms and does not need too much time to keep up with. Do you have any secret anti-aging tips to share? I would love to hear about them in the comments below, I might even try them out!